GOOD NEWS from the Himalayas! Greetings from the hills of Kumaon! As of today we have lived in Chaukori for a month and a half now. 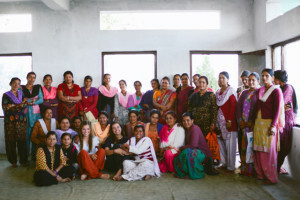 Our time here has been a blur of bottomless chai, long Naari meetings, learning “thoda thoda” Hindi, international conference calls, battling mosquitos, immersing ourselves in the community, rolling chapati, and falling in love with our surroundings. 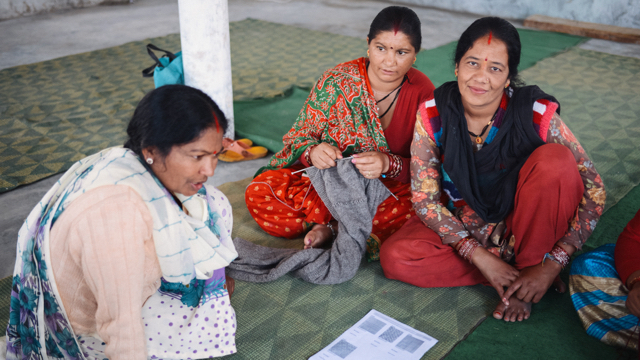 We have worked tirelessly with Himalayan Naari on different projects including recent orders, exciting improvements to the new Naari Women’s Center, leadership selection, website design, and training sessions. We have experienced countless evenings where our minds will not stop racing with ideas for the next day’s work, there is always more to do! Never in our lives have we been so lucky to work with such an inspiring, driven, kind-hearted, and energetic group of women. The colorful patterns of their kurtas can be seen as an example of their radiant spirits. Amanda has had to explain many times how the toe rings on her feet are gifts from her mother, and not the traditional Indian sign for marriage, while Danielle has laughed along as the women proclaim her quarter Japanese dark hair to be very similar to their own. Every conversation we have been able to enjoy so far begins with a smile and ends with laughter. Our meetings with the women have become the highlights of our weeks and never fail to rejuvenate our efforts. We look forward to what this year will bring for Himalayan Naari. The women have shown us how motivated they are to help the community thrive and we only hope our work will empower them to do so.